During winter, the Greater Sage-Grouse is wholly reliant on its namesake species — sagebrush — for both shelter and for food. Scientists call this bird "sagebrush obligate," meaning it needs this plant to survive. In the spring, its diet shifts to insects and plants, as it gets ready for the most fantastic mating show in the west — the lekking season. Winter has set in across North America’s vast sagebrush sea. 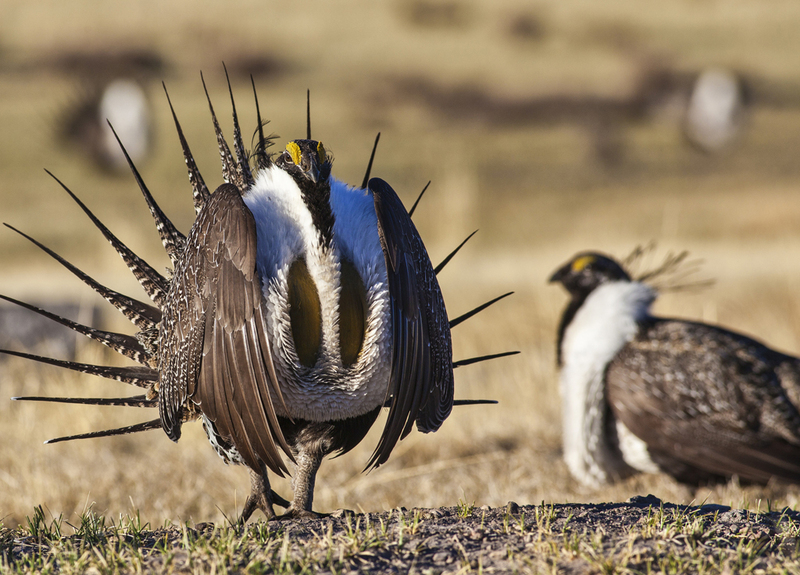 For the Greater Sage-Grouse, it’s time to hunker down. This iconic North American bird is perhaps best known for its elaborate mating display. Males inflate their chests, fan out their tail feathers, and vie for females’ attention with a spectacular dance. But winter is a quieter show. During winter, the sage-grouse is wholly reliant on its namesake species: sagebrush. Both for shelter and for food. You see, most grouse species eat small rocks and stones and store them in a muscular part of their stomach known as the gizzard. When the gizzard contracts, the roughage helps the grouse grind up its food. But sage-grouse don’t have a muscular gizzard, and they don’t pick up stones. So without the ability to grind up nutritious hard things, like seeds, sage-grouse depend on the soft, delicate leaves of sagebrush plants as a key food source to survive the long, cold winter. That makes these birds something scientists call sagebrush obligate. They need this plant to survive. When the veil of winter finally lifts, sagebrush will no longer be the only thing on the menu for the Greater Sage-Grouse. In the spring, its diet shifts to insects and plants, as it gets ready for the most fantastic mating show in the west — the lekking season. Bird sounds provided by The Macaulay Library of Natural Sounds at the Cornell Lab of Ornithology, Ithaca, New York. Recorded by GRSG 50119 G Keller.